to be everywhere! It's not yet chilly in Southern Nevada, but hope is on it's way. haha I thought I'd bring you a little FOTD to start the week. I also recently got a fringe cut in. I haven't had bangs in a while and I'm glad to have them back. Tarte: Pin-Up Blush Set (Holiday 2014 Limited) Shade similar to Exposed and Natural Beauty for the year-round range of Amazonian Clay 12-Hour Blushes. 1) Iner corner and brow bone. 2) Blending shade in the crease. 3) Crease color and lower lash line. 4) Deepening crease shade and blended onto the lide on the outer V.
6) Used on a damp brush with Prep + Prime Fix+ on the lower lid space. and fall begins on September 23rd. 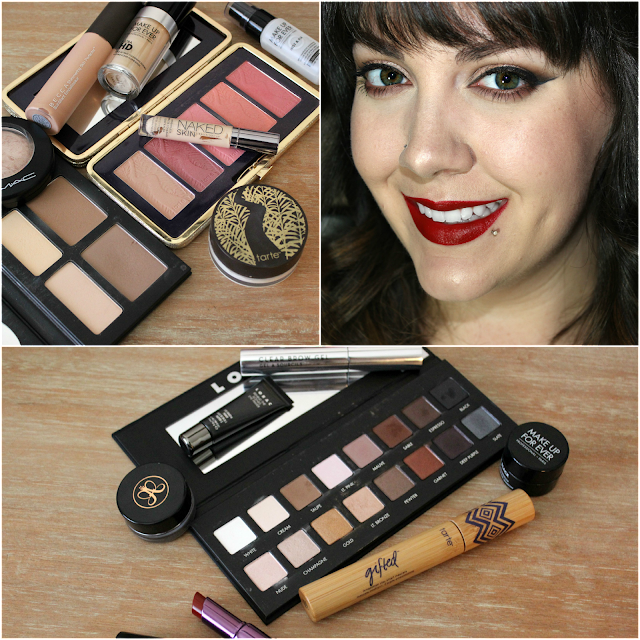 I am ready for all the vampy, smokey, reds, plums and holiday fun! Tell me what your fave fall beauty product is in the comments! PS: I will have a review of the Lorac Pro Palette and Urban Decay Matte Revolution Lipstick up this week!